Our annual celebration of monochrome moggies this year focuses on the uniqueness of black cats, proving that beauty is more than fur deep. To showcase our beloved black cats, we asked owners across the country to submit photos in the hope that their feline friend would become the face of Black Cat Day 2016. We received thousands of entries, making it a tricky task to decide who would come out on top. Displaying a whole lot of personality in his gorgeous photo, we decided that Caspar was the ideal pin-up for Black Cat Day. 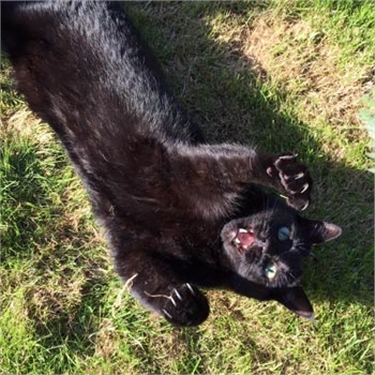 Caspar’s owner Jane Scott of Wallington, Surrey said that she was delighted Caspar had been chosen as this year’s face of Black Cat Day. Sadly, black and black-and-white cats like Caspar wait around 22% longer to find a new home than other cats. Cats Protection’s Social Media Manager Gemma Croker said Caspar was a great example of brilliant black cats throughout the country. If you’d like to rehome a black cat in your area, head to Find a Cat and see if you can find your perfect match.